Lexus of Richmond’s week 9 nominee for the Leadership Award Scholarship is Elby Omohundro of St. Christopher’s School. With his current 4.2 GPA, Elby has received high honors every semester while attending St. Chris. He is on the Double Accelerated Math Track, meaning; Elby completed the AP Calculus AB course as a sophomore and the AP Calculus BC course as a junior. He was chosen by St. Chris faculty for the West Point Book Award and attended the US Military Academy Summer Leadership Experience in 2018. While attending St. Chris, Elby was selected in 2017 for the Harold M. Marsh Sr. Connections Institute. He has held the position of School Chairperson for the program since junior year. Elby has been involved in the school’s Missionary Society and the Student Ambassador Program. He has been a member of the Robotics Team since 2016. A member of the Saints for Social Justice since 2016, he is currently a Co-Head for his senior year. As a senior, Elby is a member of the Captain’s Counsel where every team captain meets to discuss various schools events or related topics. Upon graduation, Elby will have 5 seasons of Varsity Track, both indoor and outdoor. He has been selected as a captain for both teams for his senior year. In 2017 the team won both the indoor and outdoor State Championships. Elby is also an individual 2x State Champ for the triple jump and the high jump. He is a 4x Prep League Championship MVP and a 3x State Championship MVP. Over the years, Elby has had 27 top 6 finishes at State Championship meets. He has gone on to compete at 6 National Championships for the decathlon, the triple jump, and the long jump. After being recruited by 30 colleges as a decathlete, Elby has decided to compete for the University of Virginia. Over his high school years, Elby has participated in various community service projects. Since 2016 he has volunteered for Caritas in Richmond. He has also volunteered with the Hanover Humane Society. In 2017 Elby began spending time as a volunteer coach for the Robious Bucs Youth Football team, which he is still presently coaching. Also in 2017 he co-founded Run the World. This is non-profit organization collects gently used athletic shoes and donates to those in need. Elby has won a dinner for two and is now in the running for the $10,000 scholarship. Watch the Fox Richmond – WRLH interview and the Lexus of Richmond Leadership Award interview to learn more about Elby! Remember to check Facebook for more information about each weekly nominee throughout the school year! 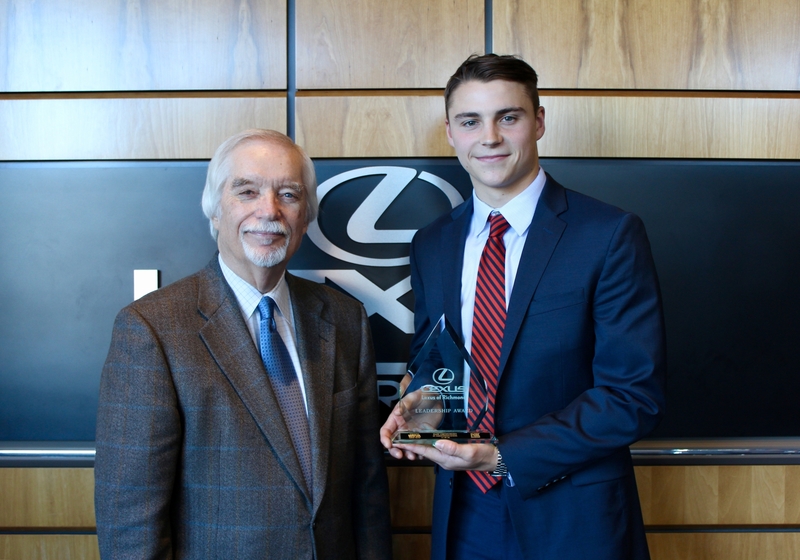 Previous PostLexus of Richmond’s 24th Leadership Award Week 8 – Sally SneadNext PostDecember Service Specials!